For many people with depression and anxiety, having a structure and routine can really help. Coping with these conditions can lead to great discomfort. What you need is a plan, a way of coping. Not only will you be dealing with the depression and anxiety using techniques and coping strategies, but you will also be dealing the vast expanse of time, that without structure can seem like an endless ocean of distress. When depressed and anxious life can seem a lonely place where you are at the mercy of your thoughts and negative ruminations. You also need to factor in meaningful activity. Addressing your mental and emotional needs. Addressing the need for human contact. Organise your day to include work (or meaningful activity), rest and leisure. Plan your day to avoid worrying over uncertainties. Eat small regular healthy meals, ovoid caffeine, sugary and junk foods. Avoid boredom or getting into a rut, this can increase stress and anxiety. If you do not work, it is very important to find interest and purpose elsewhere. Find out if there are any organisations, centres or clubs that need volunteers. If you do work, it is important to have some “you” time. Make sure that time for you is quality time. Exercise daily – it will reduce anxiety and raise your mood. Get some fresh air, even if you cannot get out, open windows. Spoil yourself while you are not well. Don’t accept put downs, try to be more assertive. Learn to say “NO” when you need to. We can’t give all the time. Let others help, but don’t lean on them. Find friends you can relax with, rather than wind you up. Set yourself small goals that you can succeed in, no matter how small. Be positive!! Positive things happen to positive people. Be yourself, remember your unique. If your appetite is down, think nutrient dense. Try to get plenty of sleep, avoid naps if sleep is difficult. Sunshine is very good for depression and anxiety. Humans are the only animals that don’t make their own vitamin C, eat an orange! Make friends with nature, put out a bird feeder. Do something creative, cut out pictures from magazines and make a collage. If you anxious lower external stimuli, dim lights, turn down television volume. Have a bath with soothing oils. Cuddle a hot water bottle if your cold. Keep a journal or diary of your thoughts and feelings. Get yourself some flowers and put them where you will see them. Break large tasks into many smaller ones. Do not make major life decisions while you are depressed. Make lists, they can really help. Keep a positive book and write down two positive things each day, however small. For more tips check out my book, “50 Tips to beat depression,” available on Amazon. “How to Help Yourself get through Depression on a day-to-day basis” www.metanoia.org/help/helpyourself. htm [Accessed 29/05/13]. “Eight Ways to become an Optimist” by Vera Peiffer, Options, Feb 1993. “20 Tips on Fighting Anxiety, Depression, and Fatigue Naturally.” www.kellythekitchenkop.com/2011/06/20-tips-on-fighting-anxiety-depression-and-ex... [Accessed 28/02/2014]. “Daily Survival Plan for Living in Hell,” Douglas Bloch. www.healingfromdepression.com/survival-plan.htm [Accessed 06/06/15]. 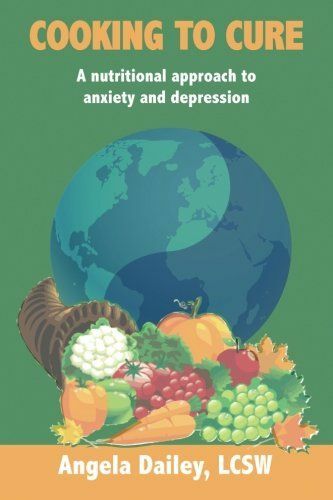 Cooking to Cure; A nutritional approach to anxiety and depression, is an inspiring, practical guide to nutrition and how a nutritional approach may help you eat your way towards better mental health. It represents an exciting cutting edge approach to health and is something researchers all over the world are looking into. Could changes to our diet be as effective as pills? Could you take control of your dietary intake to improve your mental health? With depression and anxiety as one of the most common mental ailments in the western world, it is high time we sat up and looked at dietary factors. This wonderful book explains in a very clear and understandable way how nutrients affect the brain and our moods. It details the nutritional contents of foods that are known to play a part in depression and anxiety, how much you need every day and even has a recipe section full of mouth watering meals. As someone who has for many years appreciated the “truth” and power of nutrition as prevention and cure, Angela reflects on changes to eating habits over the years. She draws on scientific research to support the hypothesis that as our diets have become more and more depleted of essential nutrients, so too the incidence of depression and anxiety has rocketed. She tells us how replacing commercially processed food with “real” food (not faddy diets!) we can reclaim our health and well-being. It is empowering and a must-read for all sufferers of depression and anxiety. The other night I woke and thought to myself, “What have I to worry about?” I realised then what I have always known; we are programmed to worry. I had nothing specific I needed to worry about, but realised that I nearly always have something competing for my attention and worry. The following morning, whilst eating my breakfast, a thought entered my mind: “What if the card machine isn’t charged when I need it?” Able to catch myself, I was able to let go and come back to the present and my breakfast. This is typical of what happens to all of us every day. Do you worry? Of course you do; we all do, as it is our natural default position. Persistent or chronic worrying is what doctors refer to as anxiety. It can impact on your daily life to the point that it interferes with work, relationships, sleep and appetite, and it diminishes your quality of life. Many people who suffer from anxiety turn to smoking, drinking and drugs (over the counter or prescribed) in an attempt to get some relief from their emotions. Some people comfort eat, whilst others starve themselves. In some cases, when worrying and anxiety gets out of control, it can lead to depression and even suicidal thoughts. We humans are funny creatures, always looking outside ourselves for the answers. We look to external reasons for tension and anxiety. All kinds of worries flit in and out of our minds: whether we will have enough food to eat, whether we will be able to find a partner so that we are not destined to spend our future alone, whether we will have a pay rise, lose a job, whether our car will break down or whether we will be able to afford a holiday. The list of worries is endless. Look a little closer and you will see that these external things: job, money, relationships, etc, are not the true cause of the negative emotional states of worry and anxiety. Worries do not come from outside and are not the result of “external circumstances,” they are the result of “internal circumstances”. Worry, stress, tension and anxiety are all the result of our thoughts. Accept Worry for What It Really Is. A worry is nothing more than a thought. Worry occurs when our mind is “future focused”. For example, if you were confronted by a lion or tiger your worry would not be about the fact there is a lion or tiger in front of you. Your worry would be that the lion or tiger might eat you! When you sit an exam your worry is not sitting the exam, but whether you will do well enough to pass! Worry is all about things going wrong, in other words, threats to our existence. Worry is simply a particular type of thought pattern, nothing more. Stress arises as a result of the internal stories we tell ourselves. Those with good imaginations make wonderful worriers! By going over things in our minds we get stuck in a cycle of thinking, replaying events, projecting forward. As we ruminate over and over we become tense and experience stress. Many engage in what I call “stinking thinking!” that king of negative rumination that spirals into a very black place and which can ultimately result in clinical anxiety or depression. Because your mind doesn’t know the difference between reality and your imaginings, the thoughts have the same results on the body no matter what. In other words, imagining an event happening causes the same physiological responses as if it were actually happening! Those who worry experience ongoing irritability, muscle tension, concentration difficulties, indecision and agitation just as though they were actually experiencing the things they worry about. The result is a constant state of arousal, feeling “on edge,” and unable to relax. Often the mental stress will be accompanied by physical stress, headaches, neck ache, back ache, chest tightness and chest pain and so on. When you learn to recognize worry and anxiety for what it really is, which is simply “thoughts”, it begins to lose its grip on you. With practice, it can become very simple to let go of worry. Using Mindfulness to let go of Worry. By doing this you begin to witness your thoughts, instead of being in your thoughts. You now have the power to choose to let them go. So notice what is on your mind at that moment and then gently let go, NOT by consciously pushing your thoughts away, but by recognising them and letting them be, as you gently turn your attention back to your breathing, paying attention to the present moment and what you’re doing. Every time you catch yourself worrying – no matter how often – you simply acknowledge, let go and return to your breathing. Eckhart Tolle, author of “The Power of Now,” reminds us, “Whatever you fight, you strengthen, and whatever you resist, persists.” The emphasis is always on what is happening, not why it’s happening. It is important not to fight your feelings, simply acknowledge in a non-judgemental way without criticism, without trying to push the thoughts away. You don’t need to spend energy fighting your thoughts, but you also no longer need to follow them and dwell on them. Simply acknowledge them, label them, put them down and move on. As soon as you struggle with the thoughts you give them power. Instead, try to observe your thoughts and worries objectively and with calmness. Simply make a mental note, without giving them any more importance or power than they deserve. Know that you will face each situation as you come to it and deal with it then. Learn to deal with stress and difficulties more wisely, by responding rather than reacting. Learn to let go of the past and leave the future until tomorrow. Let your “future self” deal with tomorrow and let your “present self” deal with today! This post was adapted from “How to Overcome Worry & Anxiety…For Good!” http://mrsmindfulness.com/how-to-overcome-worry-anxiety-for-good/ [Accessed 14/04/15]. Black. A (2015) “The Little Pocket Book of Mindfulness”, CICO books: London, New York.